Feride Uslu and Reebok team up to bring the Courtee Mid, which at first doesn't turn too many heads. Interlocking print in beige courses all over the sneaker with a white base, which admittedly looks pretty nice. There is only one problem - you cant see the beige interlocking detail that well because ... well its beige interlocking against a white base. All of that changes when the night rolls on down. 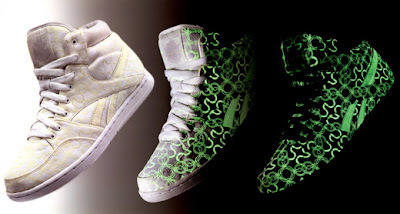 Suddenly you are presented with a black sneaker with a green interlocking glow in the dark print. The picture above speaks volumes by itself. 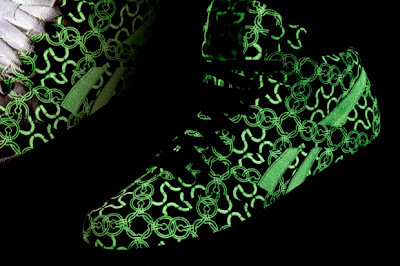 Detailed glow print on white sneakers is without a doubt one of the hottest things I've seen in a while. Unfortunately this is just the preview, so we will have to sate ourselves with these pictures for now. There is no solid release date yet for these sneakers but they're generally expected to be released around the end of March-April 2010. LOOK OUT FOR THESE SNEAKERS - Stay tuned!